Bonus for international top ups of Afghan Wireless cellular phones made by Afghans living abroad on MobileRecharge.com for family and friends. Afghans can send a Bonus too along with their regular top ups of Afghan Wireless mobile phones. Available until February 22, 2018 on MobileRecharge.com. Afghans abroad still having someone to help back home in Afghanistan can choose mobile credit transfers that now come with a bonus too, as an alternative to other online gifts. MobileRecharge.com, the platform that helps immigrants with mobile credit transfers for relatives and friends far away, runs a new offer for Afghan expats worldwide. Up to 60% more Afghan Wireless credit for calls and SMS is added automatically on any top up one makes until February 22, 2018 on this website. The Bonus is instantly received by the person in Afghanistan along with the main credit sent by the relative abroad, who can use MobileRecharge.com as an online tool to support people back home. The transaction is safe and it all boils down to few seconds only. The offer has been conceived to encourage mobile credit flow from Afghans living abroad which amount to 13% of the population of Afghanistan. According to the United Nations Migration Agency there are over 5 million Afghans making a living abroad, whether temporarily or permanently, for political or economical reasons. Over 260,000 of them live in Germany, over 97,000 settled in the United States, and over 56,000 in United Kingdom, just to mention three favourite destinations outside Asia. Those who can benefit of the current offer on MobileRecharge.com are people in Afghanistan using Afghan Wireless balance. 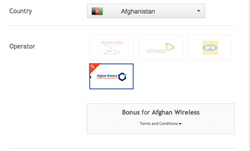 There are few simple conditions to grab the current Afghan Wireless Bonus. The Afghans abroad interested in this service need to have Internet access to visit MobileRecharge.com or use MobileRecharge app. Also, they need to have and enter all the details of the transaction in the online form on MobileRecharge.com: the Afghan Wireless number and the payment method info. -Top ups between AFN 501 – 999 bring the person in Afghanistan 30% additional bonus, available for 14 days. -Recharges of AFN 1000 to 1999 add 40% additional bonus, available for 14 days. -For mobile recharges between AFN 2000 – 3000, people in Afghanistan receive 50% additional bonus, available for 21 days. Every top up between AFN 360 and AFN 500 will receive automatically 20% extra Afghan Wireless balance for domestic calls and SMS. The maximum value one can recharge to get the maximum 60% Bonus is AFN 3000. The offer is available until February 22, 2018, on MobileRecharge.com. The Bonus can be used within a 21-day period without anyone rushing you. PayPal is welcomed along all major credit or debit cards when making the online payment, and currency is not a hindrance. No matter where the sender lives, the transaction should be ready in seconds. Mobile credit transfers from country to country take seconds online, on MobileRecharge. If the person back home is using Afghan Wireless, lucky month for him/her! Not because Afghan Wireless coverage gets even better or because Afghan Wireless is the prince of Bel Air of Afghanistan, but because the NEW offer adds up to 60% additional bonus on cellular phones topped up from abroad. No matter where they live now, Afghans abroad can have MobileRecharge.com as the platform at hand for their mobile credit transfers to people they care about in Afghanistan. Yet, those using Roshan, Etisalat or MTN balance are also eligible to receive credit from relatives or friends outside Afghanistan via MobileRecharge.com. MobileRecharge.com is the initiator of World Top Up Day, and a brand of KeepCalling, a global telecommunications company registered in 2002 in the USA, listed by Inc 5000 as one of the fastest growing companies in the USA for 5 consecutive years. Presently, KeepCalling provides its services to hundreds of thousands of consumers , with a focus on customer satisfaction. In 2015 the company registered a revenue increase of over 200% from 2011 to 2014.